We're just 13 days away from the Indians' home opener, when the Tribe will take on the Chicago White Sox. On Tuesday, the team announced a schedule of festivities to celebrate the occasion. 2019 marks the 25th anniversary of the opening of Progressive Field, and the club will mark the milestone by having former outfielder Wayne Kirby throw out the ceremonial first pitch to former catcher and current first base coach Sandy Alomar Jr. Kirby is best known for his 11th inning, walk-off single that gave the Indians a 4-3 victory over the Seattle Mariners in the first official game at then-Jacobs Field in 1994. The Tribe will also pay tribute to former player-manager and Baseball Hall of Famer Frank Robinson, who died this past February at the age of 83. 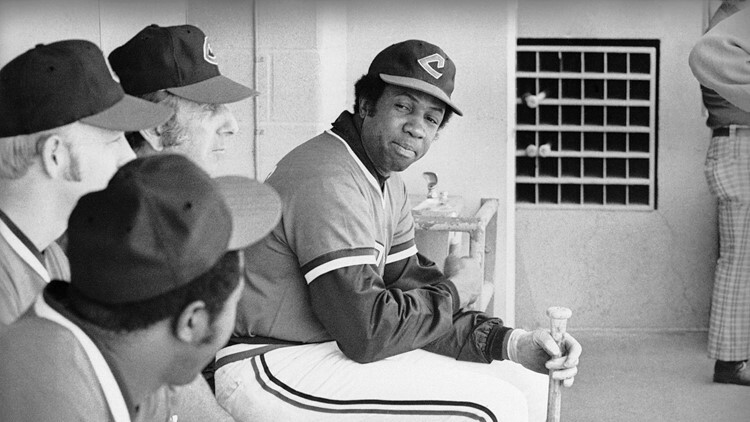 Players will wear special number 20 patches on their uniforms to honor Robinson's achievement as MLB's first African American manager with Cleveland in 1975. Cleveland Indian player-manager Frank Robinson talks with players before the start of their game with the California Angels, May 26, 1975 in Anaheim, Calif.
As is always the case, there will be a pregame ceremony that will see the entire opening day roster and staff introduced on the field. In addition, the 2018 American League Central division championship team will be recognized with the unveiling of a pennant in the right field upper deck. Retired U.S. Navy Petty Officer, 1st Class Generald Wilson will sing the national anthem, and all branches of the U.S. Military will present the colors. 250 employees from Progressive insurance will also unveil a giant American flag across the outfield. 2019 marks the Indians' 27th consecutive home opener that has been sold out, including the last 26 at Jacobs/Progressive Field. Tickets for the game on the secondary market (StubHub) are currently going for no less than $69 and a max of $425.